Early morning and dawn is beginning. I'm walking along the beach, breathing in whiffs of sea spray. 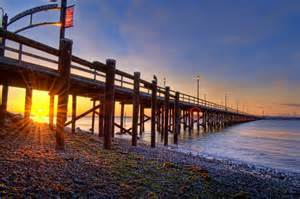 White Rock’s’ lights are fading and ocean and skies turn blue against the backdrop of a glowing sunrise. The manager told me that if rise early I will catch all nature's beauties. I'm not disappointed. Harbour seals are fishing, birds of all shapes and sizes have begun their morning songs and skim the ocean for breakfast. A mother porpoise and her baby are playing and fishing boats are gliding smoothly over the waves. The only sounds are crickets, high pitched seagulls and surf. Once in a while my laptop informs me of a new message, but I have the discipline to ignore it. This little corner of the world spells p e a c e.
The hotel has changed hands many times in the 30 years I've been coming here and every visit is different with a purposeful and personal story. Nature though is always consistent. It is a place that provides solace and 99% of the time my writers block dissolves. This year, writing about peace, felt like the 1% block. An impossible task which required a purposeful visit. Breathtaking to look upon. Except for a tall unsightly steel object placed in the middle of water reminding us of a border. An international boundary between Canada and the USA. I now understand why boats are sailing on either side of the monstrosity. In the natural world, the skies and seas are open for birds and other creatures. No passports or border patrols needed. And I'm reminded of an article by BBC Travel in 2012. "Where Birds Know No Borders"
"Unrestricted movement between Israel and the Palestinian territories is not always possible for those on two feet. But if you shift your gaze upwards, something entirely different comes into focus." A migration of a billion birds with over 540 species traverse through the skies each autumn and spring. Both countries set up birding centres for avid birders who came from all over the world to see this spectacular sight. Could this become one of the miracles I asked for last year at the wall? As I move my gaze away from the metal structure and back to reality I wonder if nature, prayers, music, dance can help us to engage and connect with the world. Earth community to find energy, insight, and guidance as we work to bring about a life-sustaining society.